Carluke High School played its full part in International Women’s Day last week, backing the worldwide drive for a more equal world. The S1 to S5 students spent the week leading up to the big day day covering a range of topics including the future of women working in new technology industries, women in sport with a talk from Rangers women’s coach Niamh Russell, the gender balance at the school and gender-based violence. 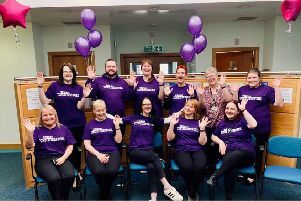 The achievements of local women were highlighted through talks held with Gill Murray MBE, a local business owner and fundraiser for Cancer Research, as well as author Paula McGuire, who started her Paula Must Try Harder group in response to her personal struggle with mental health. Former pupil Jayne Donaldson spoke to S3 about her career as Dean of Faculty Health Sciences and Sport at the University of Stirling. Jayne was joined by Lynne McTaggart, managing partner of Gordon Ferguson & Co. Chartered Accountants, and Leona Murphy, senior partner and director at Morison and Smith, socilitors. All three speakers discussed fighting against inequality and gender imbalance, with Jayne highlighting that only a third of professors in Scotland are female and only 18% of managing partners in accountancy are female. Catriona Kirkpatrick, development manager at feminist policy group Engender, spoke to S1 pupils about a range of topics still impacted by gender imbalance in Scotland. Through a quiz, Catriona pointed out that, of the 1.3 billion people living in the world, over 70% are women. Carluke Young Farmers spoke to S2 pupils about how joining the organisation is a great opportunity for all young people, whatever their gender.rama. There are also opportunities for travel nationally and internationally. Both Clydesdale’s MP and MSP are female and Aileen Campbell MSP and Angela Crawley MP spoke to both S1 and S3 groups about gender in the workplace.